Growing up in the foster care system, I longed for a sense of belonging. All I wanted was a place to call home. At the age of seventeen, I’m finally starting to feel it here. Home. When he comes along, it unsettles me. I don’t want him to ruin everything we’ve built–everything that matters. Jax Jayne is arrogant, privileged, and I want nothing to do with him. But those green eyes of his keep drawing me in. If I let down my walls, will it be my final undoing? 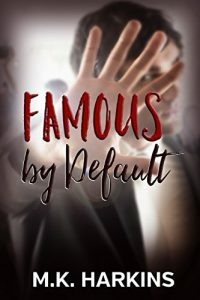 Famous by Default was one of those reads that blew me away. This was one of those books I picked up, and literally inhaled. I had a hard time putting it down for those menial tasks like eating and sleeping. I loved the alternating chapters written in Jax’s and Sivan’s POV, giving the reader a huge insight into the two sides of this complete story. Jax has lead a privileged life, but listening to his side of the story, you are confronted with the difficulties that someone in his position faces on a daily basis. Although Jax is a privileged, ego centered guy, he shows a lot of depth as the story progresses. Being sent to Aunt Betty makes him reevaluate his life, where he’s at, what he wants from life, and what he’s willing to do to achieve it. Sivan has been in the foster care system ever since her parents died, and has had a very hard, painful experience being raised there. Being taken in by Betty is her salvation, the first time since her parents died that she is safe, loved, and can have the chance to excel in the talents she put to rest when she lost her family. This book takes you on a huge growing experience for both Jax and Sivan, in a humorous, typical, teenage boy-girl way, but with an insightful, deep way, that makes you feel such a connection with both the characters. There is a great mix of laugh out loud sections, deeper, thoughtful sections, to the real, heart wrenching moments that can move the reader to real tears. Once again this is Harkins at her best. I have read all but one of her books, and to say they keep getting better is not at all an exaggeration. I’m glad to hear there will be a continuation of this tale, and I look forward to reading it very soon. MK has always been a voracious reader. After hitting a dry spell of reading material, she decided to write the kind of book she’d like to read. This resulted in the creation of her debut novel, Intentional. (Award for Best Sweet Romance – eFestival of Words- August 2014) Unintentional, Breaking Braydon, Taking Tiffany and The Reader soon followed. MK’s newest, Famous by Default, released March 2017. The follow-up to The Reader, The Jack, is due out 2017.